With a wet spring that mires roads and swells rivers behind them, Blue and Gray armies face off in the series of battles around Richmond, Virginia, now known as the Seven Days battles. Georgians count consistently in the carnage of the various encounters. Into the clash near the gristmill of Dr. William Gaines on 27 June 1862 marches a youthful sergeant, probably bright of face and strong on patriotism. Beloved son of Georgia Baptist Pastor Asa Chandler and his wife Lauriette, Sgt. Howard M. Chandler is among 57,000 Confederates who fight in the day’s savage aggressions for land and field status. Hovering around his 20th birthday, Chandler discharges his duty in Henrico County, Viirginia, amidst the 15th Georgia under Col. William M. McIntosh. He is among family and friends as his regiment consists of men from counties between Augusta and Athens, Georgia. The 15th is in reserve as fighting erupts in the heat of the day and continues into the afternoon. 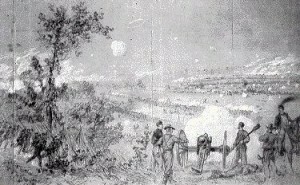 Near dusk, Gen. Robert Toombs dispatches his Georgians at the farm of James Garnett, and before dark Howard is dying with a gunshot wound to the head. One of 271 casualties in the attack, he clings to life until the 2nd of July, probably wishing to see mom and dad and his stair-step siblings who range down to toddler Fannie. His colonel, also wounded, dies June 29, one of almost eight thousand Confederate deaths during the campaign. Despite the staggering casualties that day, some Confederates climb atop captured cannon and wave flags claiming victory. Nondescript among the vast enumeration, McIntosh and Chandler give their lives in the first successful engagement for General Robert E. Lee (newly named leader of the Army of Northern Virginia) and in a conflict reassuring the South its capitol city is safe again. Chandler is buried in Culpeper National Cemetery, Culpeper, Virginia. The obituary for his mother, who dies suddenly of a stroke on 2 November 1871, speaks of the striking fortitude she exhibited in the “trying tests” of losing Howard and another son in the war.